Nearest: DLR Station: East India 0.2 miles (0.3 km), Tube Station: North Greenwich 0.8 miles (1.4 km), Railway Station: West Ham 1.2 miles (1.9 km), Motorway: M11 Junction 4 6 miles (9.7 km). The Travelodge London Docklands is located on the A13 at East India Dock Rd, Docklands, some 5 and a half miles east from the most central areas. Just to the north east of the main Docklands/Canary Wharf area (0.9 miles) and almost in-between that area and the Excel exhibition centre (1.4 miles). The DLR (Docklands Light Railway) East India Dock Station on the docklands light railway is a short walk away. The Docklands is the rival to the the City of London (Square Mile) as the financial heartland of London. Once a run down docks and warehouses now transformed into an exclusive area for work and residence with an ever growing number of amenities including shops, bars and entertainment venues. Excel is the major exhibition centre for east London with an ever changing number of shows/events throughout the year. Convenient for the Blackwall tunnel which gives road access to south London and also for London City Airport. less than a mile from the hotel, just the other side of the Blackwall tunnel is the O2 Arena (was the Millennium Dome) where throughout the year major sports and entertainment events take place. Restaurants are in the local vicinity including a McDonalds less than half a mile. Nearby places on interest include Billingsgate Market (the UK's largest fish market)(0.6 miles), London gas Museum (0.7 miles), Museum of Docklands (0.9 miles), Ragged School Museum (offering a taste of Victorian life)(1.5 miles), Cutty Sark (2 miles). The Travelodge Docklands hotel has an on site Bar/Cafe (alcohol available) with cash point facilities, Licensed bar and a Bar cafe onsite. There are bedrooms available on the ground level. Fresh towels, sheets and ironing facilities can be requested from the 24 hour reception. Please note there are no luggage storage facilities. Smoking is not permitted. There is a WiFi service. Breakfast in the restaurant is all-you-can-eat for set price with the option of a takeaway breakfast bag or taking breakfast in your room. Travelodge Docklands provides the standard facilities found in all Travelodges. Standard facilities include King-sized bed and duvet (in most Travelodge's), En-suite bathroom, Remote-control colour TV, Tea and coffee-making facilities, Direct dial phone, Internet access and In room films. Onsite standard facilities include a 24 hour reception, breakfast served (charge) and a drink/snack vending machine. Travelodge Stratford Hotel: is 1.7 miles (2.7 km) away, has a guest satisfaction score of 80% and rates start from about £49. Travelodge Excel: is 1.9 miles (3.1 km) from here, earns a customer rating of 80% and base rates begin at about £45. Travelodge City Airport: 2.1 miles (3.4 km), rated at 70% and with rates from around £81. Travelodge Aldgate East: 2.9 miles (4.7 km), rated at 60% and with rates from around £59. Looking for lower base rates? Then another option might be the Travelodge Central Tower Bridge. 0.2 miles away (0.3 km), has scored 80% from former guests and whose lowest rates start at about £51. 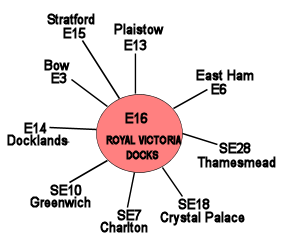 The fifty closest hotels from here (Coriander Avenue, E14 postcode) that we have data for cover a 2.7 miles (4.4 km) radius. The 50 are made up of 4 five star hotels (average rating 90%), 20 four star hotels (average rating 84%), 17 three star hotels (average rating 81%), 6 two star hotels (average rating 76%) and 3 one star hotels (average rating 62%). Top 3 star hotels are Premier Inn Docklands Excel, Premier Inn Stratford and Premier Inn Greenwich (all three rated 89%). Coming out as the top rated hotel is Intercontinental London O2 Arena (5 star) at 93%. Base Rates: Using base rates we analyse average starting rates for the area. Useful as a guide but note they do not include special offers or short term deals. The average rate for all the 50 nearest hotels is £83 per night. Starting from £35 at City View Hotel (1 Star, 56%) up to £250 at Fox Apartments (4 Star, 90%). Averages by star rating: Five Star average: £146, Four Star average: £99, Three Star average: £67, Two Star average: £57 and One Star average: £41.